One of the best parts of giving a gift is seeing the reaction of the person upon opening. Hopefully the giver gets to see just how much it made the person’s day to see the love and thought that was put into finding the perfect gift for them. This is especially true when a gift has been personalized with a name, initial, quote, or special date. Just think about how special it is for a newly married couple to finally see their last name on an item that they will share for years to come, or a newborn’s name and birthday on a frame that will contain his/her first picture! Choosing the right personalization is key. Here is a quick guide to doing just that next time you are in gift giving mode. Initials, Monogram, or Letters – Giving a gift that has a person’s initials, monogram, or first letter of their name makes it a fun and personal gift. For example, if you have a wine lover as your friend, what could be better than a personalized wine cork to keep handy when entertaining? Or if you have a friend or relative who loves to travel, why not get a set of luggage tags that have their initials so baggage claim is a breeze. A Full Name – While not as popular as initials and monogramming, a full name is a great personalization to consider when there is a wedding to celebrate or the birth of a baby. Everyone loves to see their name on new items, especially when that name is something new and precious. 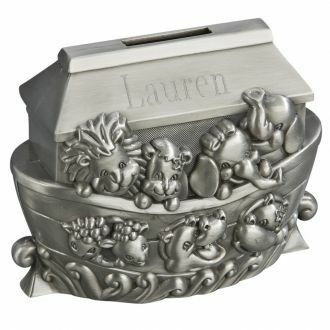 For example a baby bank or cross would look lovely with the full name of the child. 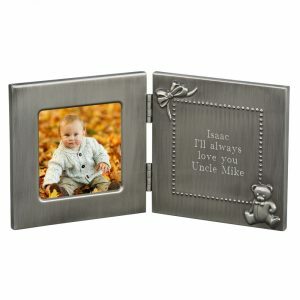 In addition, newly married couples who have taken the same name also love to see items with their family name engraved! Quotes or Dates – While not all items have spaces big enough for a quote that is meaningful, some do and this should be considered if there is a special message you would like to get across such as “I love you” or “Forever Mine”. Dates are also a spectacular idea when a milestone is being celebrated. For example, a birth date, a retirement, a wedding day, graduation, or any big milestone in a person’s life is a great time to include a date as personalization. Check out the wide array of gift Creative Gifts Direct offers to all of these milestones. Consider personalizing your item to make it even more special. Visit our website to find out more. 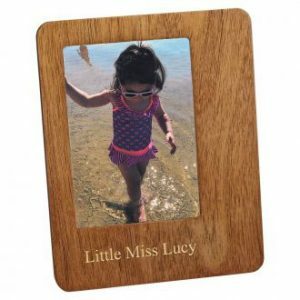 This entry was posted in Engraving, Personalization on May 2, 2018 by Creative Gifts.